In accordance with the Commandment of Allah Almighty, each human being has been assigned two recording angels. These angels write down all our deeds - good, bad and whatever is in between - our thoughts, feelings and intentions. "He is the Omnipotent over His slaves. He sends guardians over you until, when death comes unto one of you, Our messengers receive him, and they neglect not." (6:61) Al-Anam. Also .. "Or deem they that We cannot hear their secret thoughts and private confidences ? Nay, but Our envoys, present with them, do record." (43:80) Az-Zukhruf. Allah Almighty created angels just as He created humans, jinn and other species. Angels are incapable of disobeying Allah. They follow His orders meticulously and most loyally. Angels worship Allah Almighty alone. As ordained by HIM, angels have a significant role in the life of human beings. They are present with us (invisibly), they record our deeds and they are present with us while we worship Allah Almighty .. constantly noting every act and intent. More on angels on our post Angels. The Almighty created everything for a purpose. HE created the angels to worship Him and carry out His orders in the universe. ".. who resist not Allah in that which He commands them, but do that which they are commanded." (66:6) At-Tahrim. The two recording angels are menioned in the Glorious Quran as Kiraman-Katibin (كراماً كاتبين ). This expression means "honorable recorders" or "noble recorders." "Indeed! there are above you guardians, Noble and recording, Who know (all) that you do." (80:10-12) Surah Infitaar. The Arabic terms "raqibun atidun" ( رَقِيبٌ عَتِيدٌ ) also used for the recording angels means "observer ready" as in Verse 50:18 quote: "He utters no word but there is with him an observer ready." Some of our Muslim teachers who aren't too well informed, assume "raqib" and "atid" to be the names of the recording angels. That's not correct. Raqib means observer or watcher, and atid means to be ready or can also be interpreted as a state of preparedness. The term "raqib" is a common noun while "atid" is an adjective. Hence, the vigilance or the alertness of the two recording angels are described in the Verse as observers who are ready for their job of recording the deeds of every person. Similar to the expression "two Receivers" in the previous Verse 50:17 quote "When the two Receivers receive (him), seated on the right hand and on the left,"
Another point that needs to be clarified emphatically is that uneducated clerics have spread the story that the two recording angels are on either side of our shoulders. 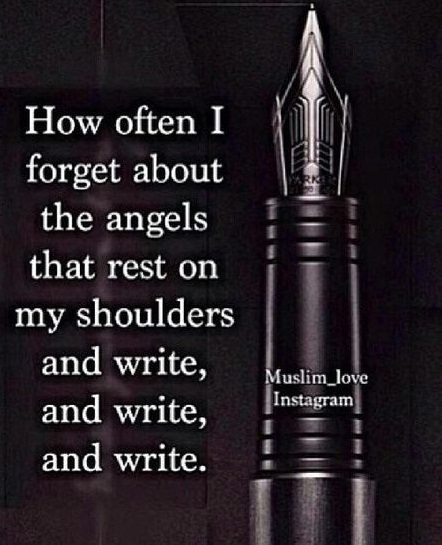 The Quran does NOT mention any angels placed on the shoulders. We only know that the two recording angels are constantly present with every person, recording their deeds. That is very easy for Allah, Who only needs to say كُنْ فَيَكُونُ ("Kun Faya Kun"), or "Be, and it is" to implement or create whatever He decides. Let us not limit The Limitless with the doubts of our limited perception. The Quran mentions only four angels by name - Gibreel, Mikaeel, Harut and Marut. For details kindly check our post Names of angels in the Quran. Our acceptance of the presence of angels around us makes us feel that we are surrounded by other creatures of Allah at all times and in all places by His command, and that Allah Almighty is in charge of everyone and everything. Alhumdulilah. We can only confirm what's confirmed in the Quran that there are angels designated by HIS command to watch over every individual throughout their earthly lives to retain a complete account of all their deeds. "For him are successive (Angels) from (before) (him) and from and behind him, who guard him by (the) command (of) Allah." (13:11) Ar Raad. Human curiosity often runs wild with queries asking "if angels are guarding humans all the time then how do we fall prey to dangers?" Allah Almighty never promised anyone in this world that they wouldn't face a variety of difficult situations. Neither did Allah ever guarantee anyone that they would never be victims of tyranny or tragedy. He never said the temporary path would be smooth from start to finish. This earthly world is a place for trials & tribulations, pain & misery. The Quranic expression in the above Verse "They guard him ...." refers to the fact that no one is ever truly alone but their deeds and intent are always being watched, recorded. Allah has appointed His creatures, the angels, to watch each one of us. The basic purpose of angels guarding us refers to the existence of permanent witnesses recording all our deeds. It's yet another display of the amazing power of Allah The Almighty, His creation (in this case the angels) constantly working for Him, following His orders and obeying Him. Then again, some folks may ask: Since Allah can see everything and knows everything, what need is there for angels to watch and write what we do? The answer is simple. Of course, Allah Almighty knows everything. The reason why deeds are written down or recorded is only to serve as witnesses against us on the Day of Judgement, to confront us with the precise acts and intents we performed or harbored that will leave us wonderstruck and fearful as most humans tend to forget, subconsciously presuming Allah isn't aware of much of their deeds. They take HIS All-Knowing Supreme Power as a joke. But when they see their own kitab (book) spelling out each and every deed of theirs noted in it, they will be speechless and unable to make excuses nor refute it. The recording book will be a pleasure for the righteous, but will leave the wrong doers numb with fear. They will be left with no other argument but to concede that they were sinners / violators / transgressors. This is Allah's purpose of writing our deeds, to prove to our own selves everything we did as evidence, and Divine Justice is flawless; that in the Hereafter Allah only punishes us for the violations we committed in earthly life. "And every human being's destiny have We tied to his neck; and on the Day of Resurrection We shall bring forth for him a record which he will find wide open; [and he will be told:] "Read your record! Sufficient is your own self today to make out your account!" (17:13-14) Surah Al-Israa. Verses 17 to 21 of Surah Qaf are worth noting. "When the two Receivers receive (him), seated on the right hand and on the left, He utters no word but there is with him an observer ready. And the agony of death comes in truth. (And it is said unto him): This is that which you were wont to shun. And the trumpet is blown. This is the threatened Day. And every soul comes, along with it a driver and a witness." (50:17-21). The above Verses describe the time of the soul's departure on its final journey. The "two Receivers" are apparently the recording angels who will receive every departing soul at the time of death. And then on the Day of Resurrection and the Day of Judgement, the same two recording angels - "driver and a witness" - will accompany each soul. "Say: Allah is more swift in plotting. Indeed! Our messengers write down that which you plot." (10:21) Yunus - NOBLE QURAN. "And you (Muhammad) are not occupied with any business and you recite not a Lecture from this (Scripture), and you (mankind) perform no act, but We are Witness of you when you are engaged therein. 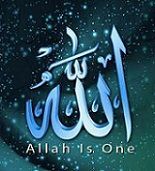 And not an atom's weight in the earth or in the sky escapes your Rab, nor what is less than that or greater than that, but it is (written) in a clear Book." (10:61) Yunus - NOBLE QURAN. Fantastic! This comes at the right time when I had been gathering some points on this topic for my info as I wanted to take it up at our community center get-together end of this month. It's really an incredibly important matter if you think of it. Every second of our lives, even if we drop a spoon on the floor and pick it up, goes into record. Not that there's anything wrong in dropping a spoon or any such mundane occurrence; but it's worth reflecting how perfectly Allah is acquainted with each and every act of ours. While you may drop a spoon on the floor and forget about it 20 minutes later. Allah has it all recorded as a part of your earthly life. Wowie!! SubanAllah a billion times! Now folks, somewhat connected with this topic, I have a little question. Is the Divine decision of sending a person to Jannah or Jahannam firmly dependent on good deeds outweighing bad deeds? Or is this Divine Law flexible? Super post and an indispensable reminder. I would say that it's this record that contains the results of our life's exams that are presented before Allah for reckoning. A very comprehensive evidence of every bit of our earthly work - good or bad or in between. I'm sure it will be quite an amalgam in everyone's case. Thus, let's be constant to grasp guidance to its maximum for only that can keep the record clean. I suppose this is what Mufti Menk was getting horrified about and finally like a coward lost his nerves by imploring Allah to overlook it. May Allah preserve us from becoming like Menk. Concerning your question Sister Ruhi, a good one but not easy to answer. It's ultimately up to Allah. Every soul has its own story and Allah will decide accordingly. However, good deeds outweighing bad deeds and vice-versa is the standard Law of confirmation of a person's ultimate fate. This has been stated, rather confirmed, in Surah Al Qariah, quote: "Then, as for him whose scales are heavy (with good works), He will live a pleasant life. But as for him whose scales are light, A bereft and Hungry One will be his mother, Ah, what will convey unto thee what she is! - Raging Fire." (101:6-11). These Verses highlight the system of infallible measuring and judgement of one's positive and negative deeds by the Divine Power. What Allah decides after that is entirely up to Him. However, I repeat, according to His standard Law as stated in the above Surah, generally those whose scales are heavy with good deeds will be the successful ones while those whose scales are light (that is, lacking in good deeds) will be the losers. "The weighing on that day is the true (weighing). As for those whose scale is heavy, they are the successful. And as for those whose scale is light: those are they who lose their souls because they used to wrong Our revelations." (7:8-9). Therefore yes, the result of the weighing is vital. However, His Mercy is also rampant. Thus only He can confirm the case of each individual. It's impossible for the human perception to surmise beyond that. Many thanks me Sis! Very helpful read ..... understand your point perfectly. Alhumdulilah. And now gotta trouble you guys with one more query. Is Sijjin and Illiyin the same as the book of deeds recorded by the recording angels? 83:18-21 refer to our recorded deeds as discussed in all the Quranic Verses quoted in the original post of this thread. That is my opinion. Only Allah knows best. Great piece of knowledge. Allah reward you Sister. Ameen. The recording angels are not the same as the angel of death, right? I cannot fully confirm that. However, I feel quite certain they aren't. Angel of death or Malik-ul-Mauth only comes to take charge of the soul when it departs from the body, that is, only during the time of death. The recording angels are two who are always present with every individual, their job being to record facts every minute from birth to death. So, I tell myself, obviously how could they be the same? Though from what I gather from Quranic Verses 50:17-21 (quoted in my post), the recording angels are present during the time of death. Or at least one of the recording angels referred to as "an observer" is definitely present at that time. However, I feel quite sure this doesn't refer to Malik-ul-Mauth. But only Allah knows best. Right .... makes sense. Thanks sister. Salam everyone. Does Verse 13:11 of Surah Ar-Rad also refer to recording angels Kiraman Katibeen? Can anyone explain the reference of the preceding Verse 13:10 quoted as follows ..... does it have a link with the recording angels? Walaykum Salam. Yes sister, the reference in V.13:11 is definitely to the recording angels, appointed by The Almighty, and these recording angels keep track of every deed/intent of every person. V.13:10 elucidates the truth that Allah Almighty has complete knowledge of the visible as well as the invisible. Whether a person whispers or talks aloud, is the same for Allah for He is aware of both. If someone walks in the darkness of the night, we might not be able to see that person, but Allah knows and He can see just as clearly as broad daylight. This verse isn't connected with the recording angels. Rather it asserts that Allah is directly informed of everything. The recording angels are the creations of Allah and appointed by Him to do their job. But even if the recording angels weren't there, it would make do difference for Allah knows everything, He sees everything and if He wants to order something He only needs to say "kun faya kun" that is, “Be!” And it is! Thank you very much brother. That makes it clear to me. Alhumdulilah. Thanks for the articulation, br. TS. Very helpful. Allah bless. As-Salam Alaykum sisters and brother: Just a final feedback on V.50:17-21 from you guys for my upcoming meeting at the community centre. Focusing on the underlined words .... "two Receivers .. observer .... a driver and a witness." So, we can presume that all these terms refer to the recording angels assigned by The Almighty to every person, right?